Paul Muller-Ortega teaches Audio Courses on specific texts and topics of the Tantric meditation tradition. These lively courses offer profoundly illuminative and useful teachings from the comfort of your own home. You may join the live courses as available, which include course recordings, and / or purchase previous course recordings for continued listening and study. See the schedule below for Audio Course dates and registration. To purchase previous recordings of Audio Courses that have passed, please visit our Store. The Shiva Sutras, an extraordinary, rich and complex text revered by many spiritual traditions, emits a powerful wisdom stream on the topic of systematic practice and the spiritual path, the nature of Reality and human awareness. It is a key guide to opening a mystical perspective on life for any spiritual practitioner including students of yoga, meditation, the science of Consciousness and those seeking to engage in personal as well as planetary transformation. The text is truly Universal in what it articulates about the nature of Consciousness. This webinar series is open and accessible to anyone. Those new to the Shiva Sutras will be introduced to the key concepts in a sequential and approachable manner, while more advanced students will dive ever more deeply to refresh, enliven and activate greater understanding and insight. All students will benefit from working with master teacher Paul Muller-Ortega who has been immersed in in-depth study and translation of this text for nearly 50 years. His grasp of the deep teaching this text encodes and his ability to eloquently share that knowledge make this an important opportunity for students of all levels to study and experience personal growth. Paul Muller-Ortega is uniquely qualified to offer these potent teachings, drawing upon the synergy of his long career as an academic scholar, his particular capacity to translate complex ideas and concepts into easily accessible and comprehensible understanding, and a personal history of deep meditation and extensive practice in the Shaiva Tantra tradition. Students currently enrolled in 2019 Blue Throat Yoga study courses are eligible for special pricing (see registration form for details.) Click Here to Register. The groundbreaking “Visions of Luminous Consciousness: The Shiva Sutra Teachings” is an ongoing series of original translations and teachings on the foundational text of the Tantric Shaiva tradition. Each series contains three live sessions that give access to the powerful principles, teachings, and themes presented in the Shiva Sutras, especially those that are most relevant and useful to daily life and the path of sadhana, or spiritual practice. to a sublime space of the uttermost Consciousness within us. deepest embodiment of what is most real, most valuable, and most meaningful. 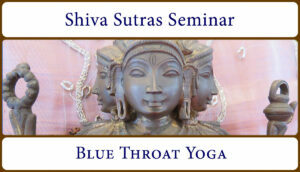 You may register for the current or upcoming Shiva Sutra Series as available and purchase previous series in the Store. The “Meditation Teachings of Tantra: In the Pavilion of Sacred Repose” series is an excellent overview of the Tantric householder path of spiritual practice. The always-illuminative previous sessions of the series are available in the Store, along with additional teachings on Tantric meditation and spiritual practice. These are a great introduction for someone new to these teachings as well as the seasoned practitioner to hear something new each time. Join our newsletter to receive updates, announcements, and a download of our commemorative 10th Anniversary Booklet!